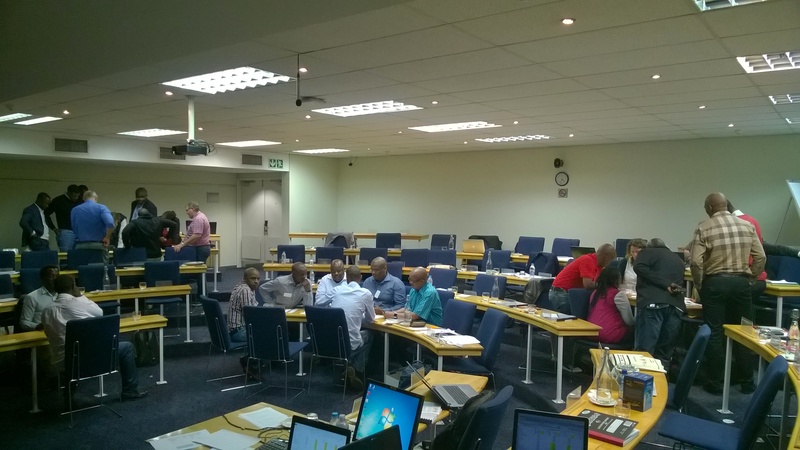 Day 5 of the continuing professional development course further developed the theme of policy and governance, and the role of local government, in energy planning, as well as addressing financing for local government energy interventions. The morning sessions once again highlighted the intersectionality of energy with every discipline of local government, and the need for whole-system approaches to energy transitions, with appropriate solutions at all levels of government and governance. Sarah Ward from the City of Cape Town Energy & Climate Change Unit t presented on the development of South African national and municipal energy policy in the last 20 years, and the fact that cities in the future must help to drive energy policy, rather than ‘receiving’ policy from a national level. Knowledge of local contexts can help local authorities to drive their agenda for the green economy, rather than resorting to a ‘tick-the-boxes’ approach. SAMSET project municipal partner John Behangaana, Town Clerk of Kasese Municipality in Uganda, presented on the vision of Kasese for energy transitions, and projects to date in the municipality. This highlighted the importance of partnerships for implementation of energy projects, as Kasese has partner successfully with other municipalities, companies and organisations to improve sanitation and electricity supply in the municipality. 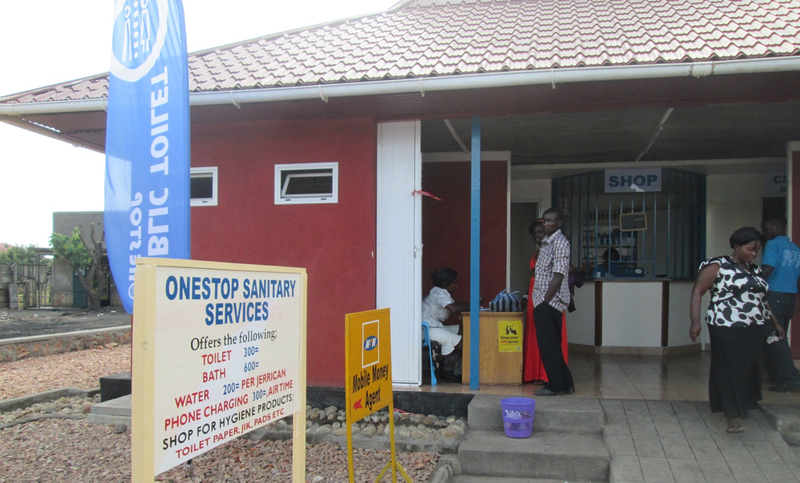 These include Aalborg and Frederikshavn municipalities in Denmark for ‘one-stop sanitation shop’ development across the urban area of Kasese, as well as the WWF and System Teknik A/S for the Kayanja Solar Hub project, providing solar lighting and micro-grid services for off-grid households. 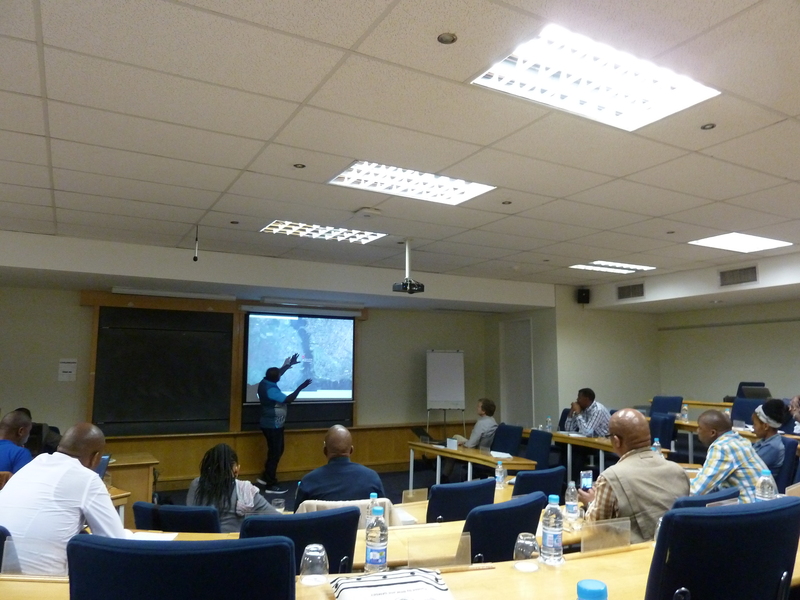 Roland Hunter, in his capacity as ex-Chief Financial Officer of the City of Johannesburg, presented on municipality financing in Sub-Saharan African and its implications for energy transitions. City finance can broadly be split into operating revenues and capital finance sources. 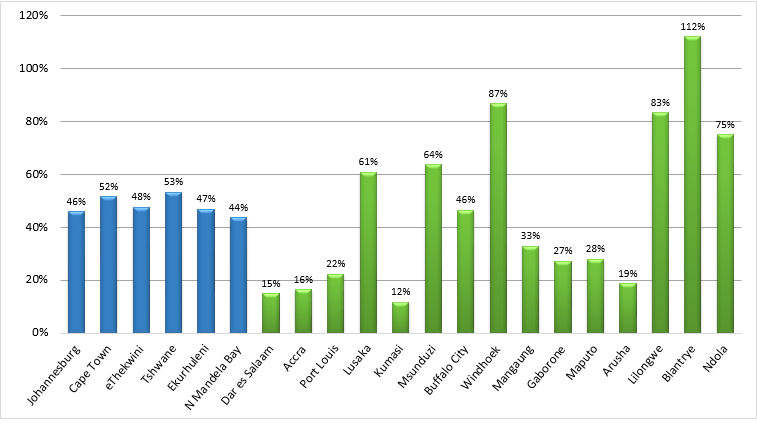 Despite huge GDP growth in a number of Sub-Saharan African cities, with the exception of South Africa city spending on municipal operations as a proportion of GDP remains very low. This is often a result of a weakness in revenue administration: without sufficient revenue collection, spending cannot increase. This leads to a degradation of services, and then further unwillingness to pay among revenue sources (taxes, licensing etc.). This so-called ‘vicious spiral of performance decline’ is indicative of many Sub-Saharan African cities. Through building tax payer support, increasing revenue collection strength and enforcement, and improving service quality through investment and resourcing, this can be turned around. Two broad challenges concluded the presentation – the local revenue relationship in municipalities, and the assigned revenue powers to municipalities from national government. 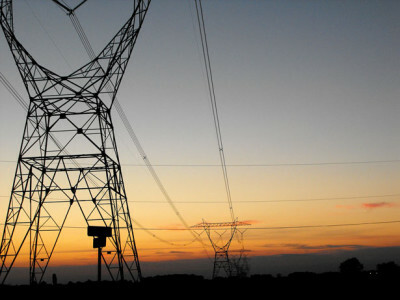 Implications in the energy sector are widespread, including a lack of infrastructure financing capacity as a result of this, leading to a reduction in decision making powers in the sector, as well as the strength of national agencies for energy in many Sub-Saharan African countries. The end of day five saw a closing address from Professor Daniel Irurah of the University of Witswatersrand, bringing together the ideas from across the week that urban energy transitions are a necessity in the coming period, if rapid urbanisation and energy consumption increases are to be addressed in a sustainable manner. Local approaches for local solutions, considering whole-system approaches in energy transitions, the importance of stakeholder engagement and participatory planning, and strengthening governance and the role of municipal government in energy transitions, were all highlighted as key factors in moving forward. 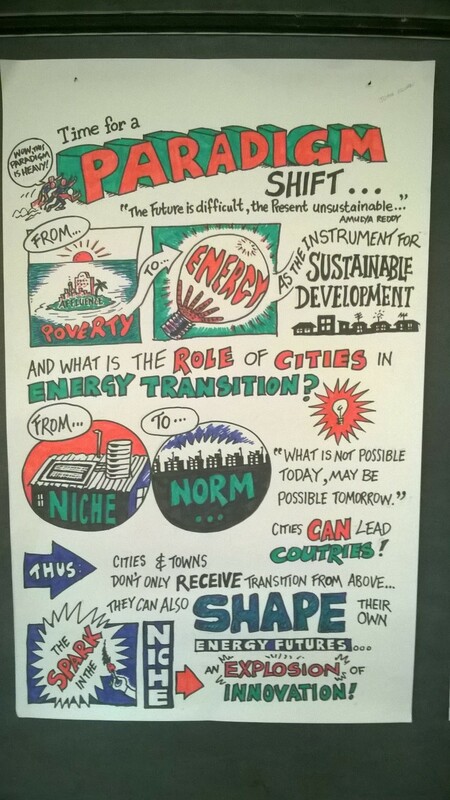 One of a series of cartoons produced for the Energy and Sustainable Urban Development course, highlighting the role cities can play in driving energy transitions in developing countries. This entry was posted in Administration and tagged Energy Transitions, Financing, Local Government, Municipal Financing, Municipal Governance, Paradigm Shift, Partnerships in Energy, Professor Daniel Irurah, Revenue Administration, Revenue Relationships, SAMSET, Stakeholder Engagement, Sustainable Urban Development, Urbanisation on December 22, 2014 by danielkerrucl.